It's the second Wednesday of the month....which means The Sisterhood of Crafters has a new challenge up! Our hostess this challenge is Vickie! She has asked us to use diecuts and/or punches! You have until March 20th EST to get your projects uploaded! supplies: papers- sky, sugar and grass cs (amuse studio) and everything's rosy text paper (amuse studio); stamps-crazy friends (amuse studio);ink- onyx black (versafine) and copic markers; accessories-red and white baker's twine (amuse studio) and tag bundle die set (amuse studio). I think this is my favorite card I have made so far this year! Use Your Stuff...lace, ribbon or twine. 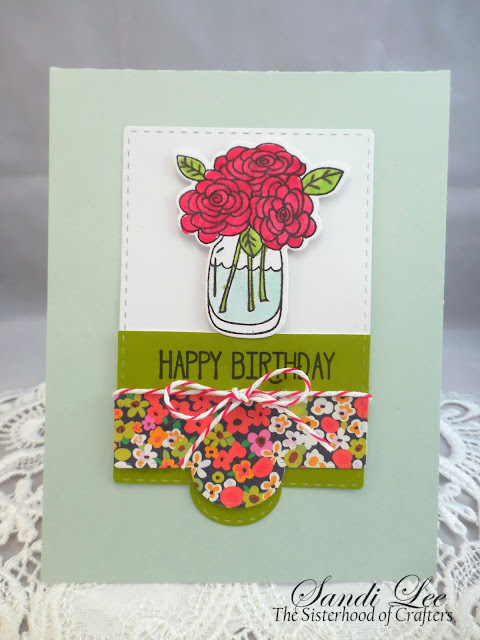 Amusing Challenge at Stamped Blessings...happy birthday challenge. Craft Your Passion...always anything goes. Crafting from the Heart...always anything goes. Very pretty and such lovely Spring colors.....hope you are having a great day! I love your beautiful bold colors. Your use of baker's twine was just perfect and I also love the dimension you created with the different layers. Thanks for playing along with the ribbon, lace, and twine challenge at Use Your Stuff. I hope to see more creations from you in upcoming challenges! So pretty! Would have never thought to turn that tag around upside down! love it! Beautiful card; love the vibrant colors. Great card! I love all the space around the image, very crisp and clean! Thanks for joining our twine/ribbon/lace challenge at Use Your Stuff and hope to see you again. Such a happy, spring card! Lovely. Great card. I like the patterned paper. This is so pretty! Love your colors/paper choices - they just make me happy! Thanks so much for joining us this week at Use Your Stuff!